Tel qu’on peut le constater sur cette photo, mon gabarit à biseauter, vieux de plus de 20 ans, a, tout comme moi, cambré avec le temps. Il est temps de le remplacer. 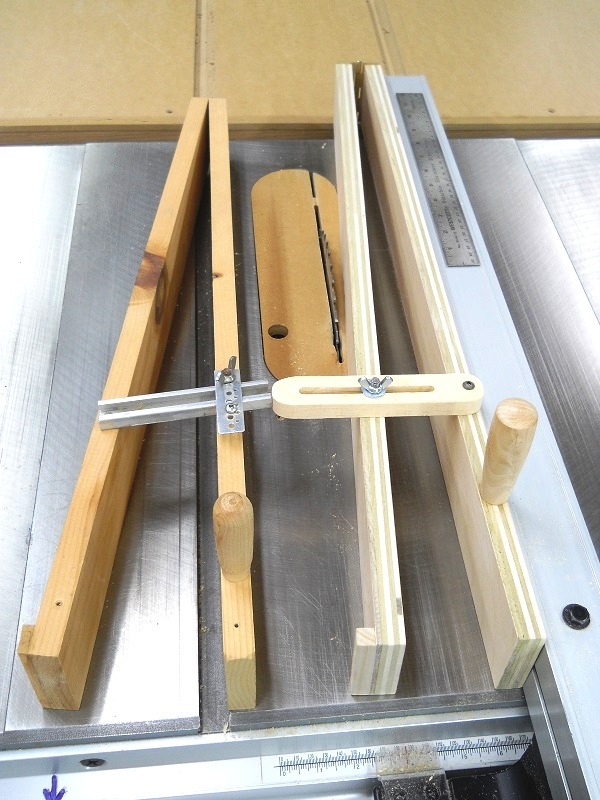 As you can observe on this photo, my tapering jig, older than 20 years, has, as I did, arched over the years. It’s about time to replace it. Pour remédier à ce gauchissement, je fabrique mon nouveau gabarit avec du contreplaqué de merisier 3/4″. 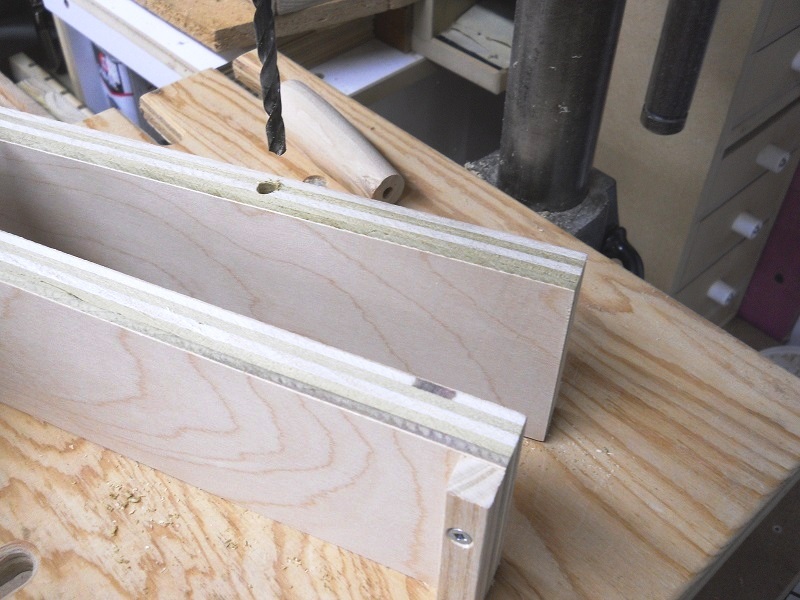 To remedy from this warping, I’m building my new jig using 3/4″ birch plywood. Deux lattes, plus longues que la profondeur de mon banc de scie, sont coupées de façon à dépasser la hauteur du guide parallèle de mon banc de scie (et des boulons qui le surplombent). Two strips, longer than my table saw depth, are ripped so they will end up higher than my table saw rip fence (and the protruding bolts). Après avoir sélectionné une poignée adéquate de ma collection, j’ai coupé la pointe que j’ai jugée trop étroite. After selecting the adequate handle from my collection, I cut what I judged the too narrow tip. Mis à part le contreplaqué, sont requis – une poignée, un tasseau rainuré, une charnière et ses vis, un goujon 1/4″ (tourillon), une butée, une vis à ailette 1/4″, une rondelle et une vis double filet bois/métal 1/4″. 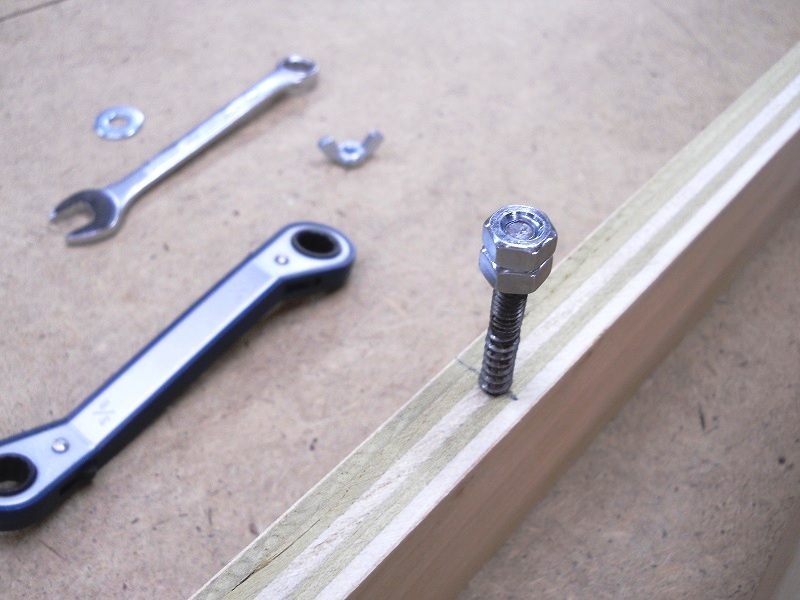 Besides the plywood, are needed – a handle, a slotted cleat, a hinge and its screws, a 1/4″ dowel, a stop block, a 1/4″ wing-nut, a washer and a 1/4″ hanger bolt. Je trace, perce et visse un côté de la charnière à une extrémité d’une latte de contreplaqué en m’assurant que la charnière reste à l’intérieur du périmètre du contreplaqué. 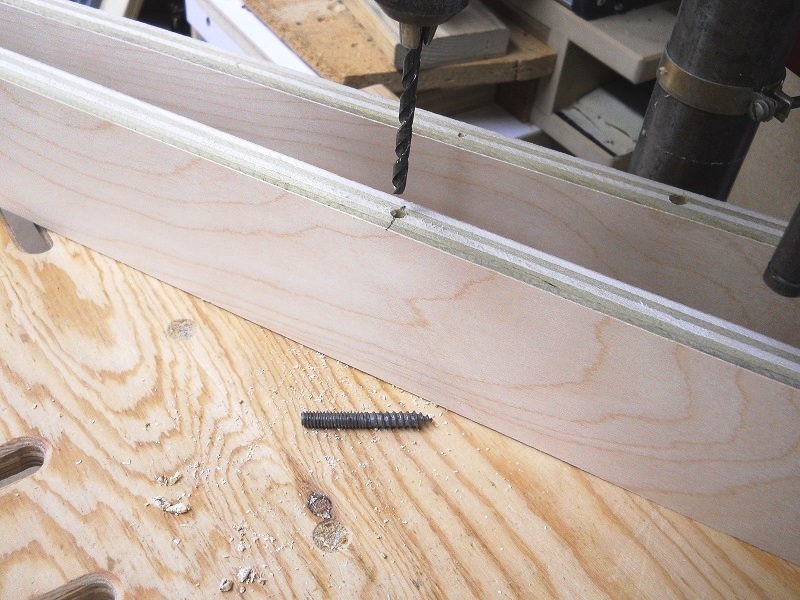 I trace, drill and screw one hinge wing at the end of a plywood strip making sure the hinge stays within the perimeter of the plywood edges. Ici je m’assure du parallélisme (crucial) en insérant une pièce entre les deux lattes de contreplaqué. Je trace, je perce et je visse, toujours à l’intérieur du périmètre. 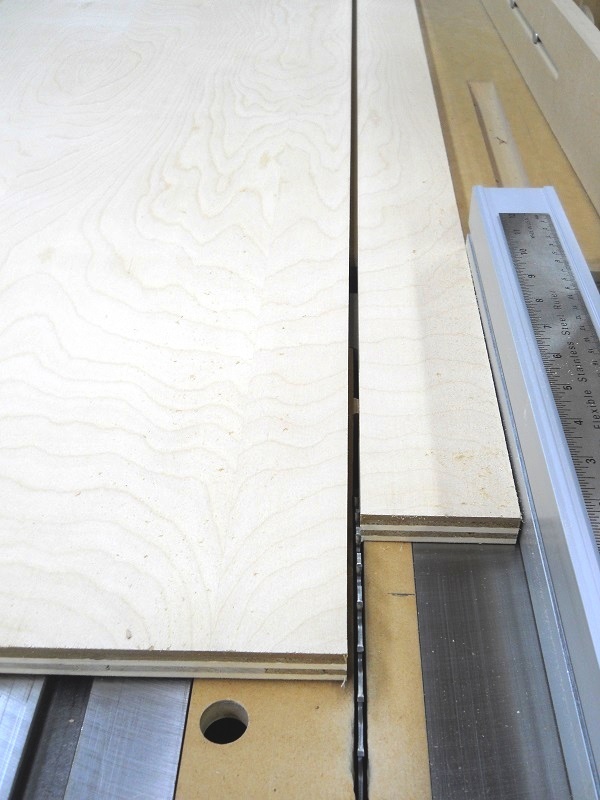 Here I ensure parallelism (crucial) by slipping a piece between the plywood strips. I trace, drill and screw, still within the perimeter. Je fixe la butée du côté intérieur d’une latte de contreplaqué. 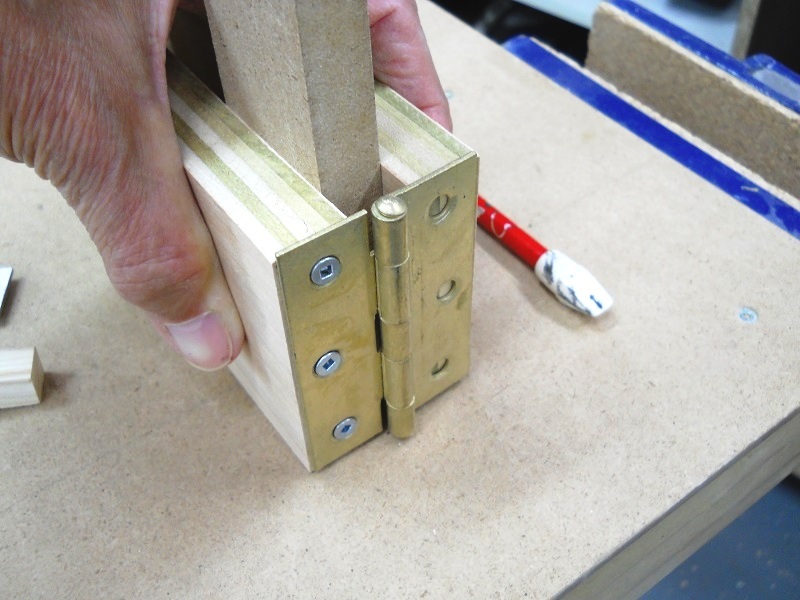 I secure the stop block on the inner side of a plywood strip. J’arrondis les extrémités du bras d’ajustement à ma ponceuse à disque maison. 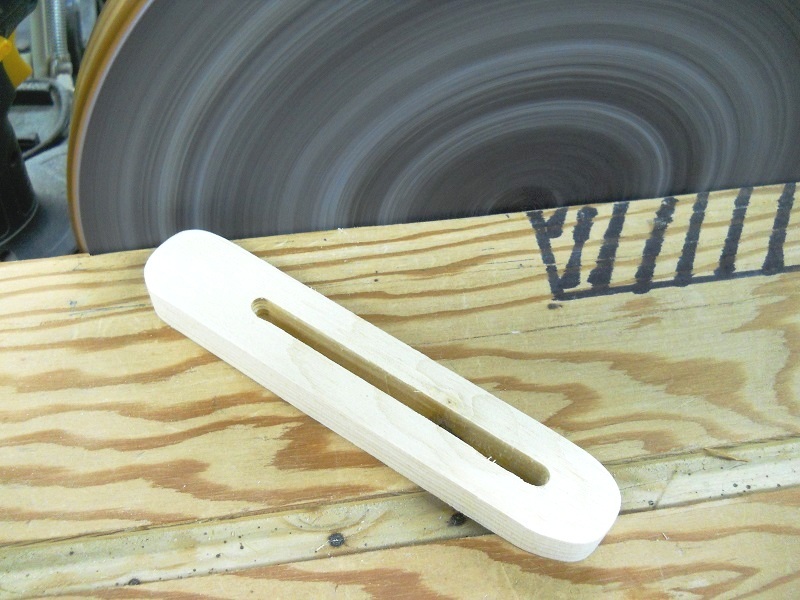 I round over the ends of the adjustment arm at my homemade disc sander. Ici je perce un trou de 1/4″ pour le goujon qui fixera la poignée. 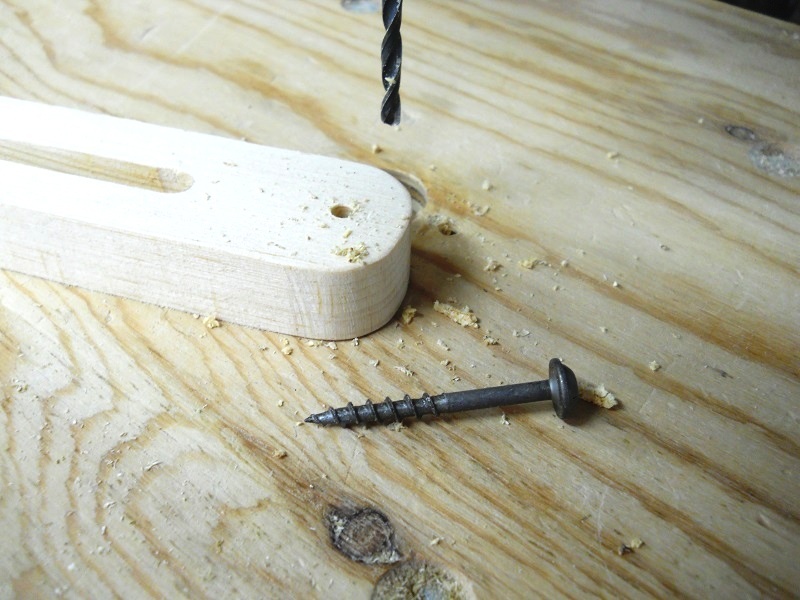 Here I’m drilling a 1/4″ hole for a dowel to secure the handle. Toujours à la perceuse à colonne, je perce du même diamètre que cette vis pivot. Still at the drill press, I drill a hole the same diameter as this pivot screw. Vis-à-vis la vis pivot, je détermine, marque l’emplacement et perce (13/64″) pour la vis double filet. 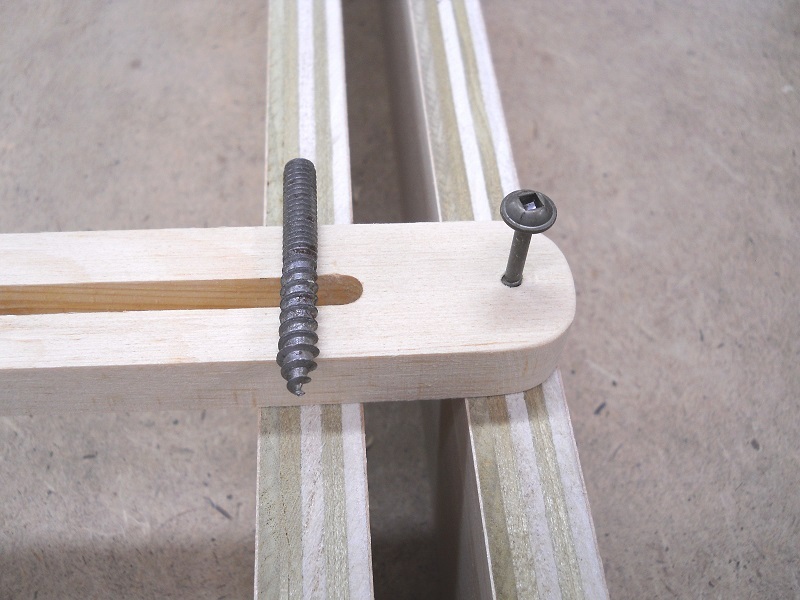 In line with the pivot screw, I establish, mark the location and drill (13/64″) for the hanger bolt. La meilleur façon d’enfoncer une vis double filet est de bloquer deux écrous sur les filets avec deux clés et ensuite la visser avec une clé. Lorsqu’enfoncée, libérez les deux écrous de la même manière. The best way to drive a hanger bolt is to lock two nuts on the threads using two wrenches and then drive it with one wrench. When done, unlock the two nuts the same way. Finalement je colle le goujon (tourillon) et la poignée sur le gabarit. 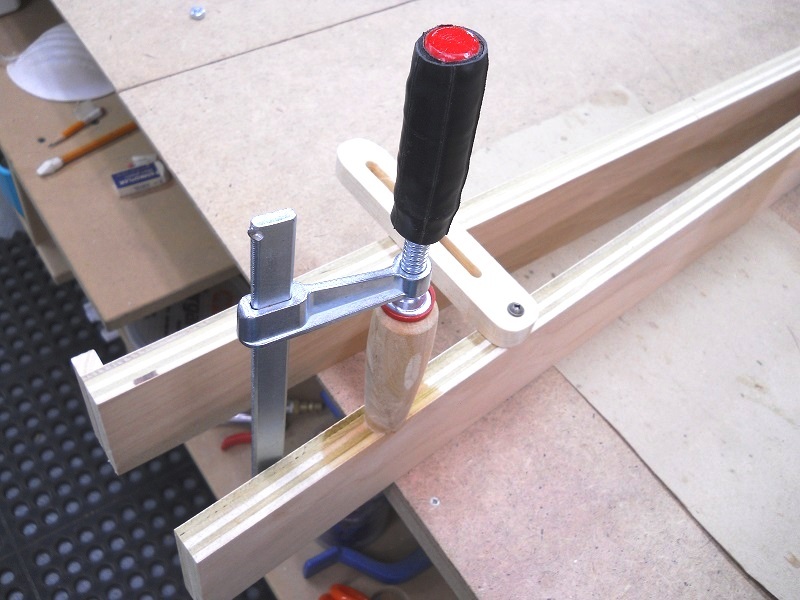 Finally I glue the dowel and the handle to the jig. Voici, quelques heures plus tard, mon nouveau gabarit rectiligne, prêt à l’emploi. À noter que la lame de scie ne peut couper le bras d’ajustement compte tenu de sa limite de 3″ en hauteur, soit la même que la largeur des languettes de contreplaqué . Here is, few hours later, my new straight jig, ready to use. 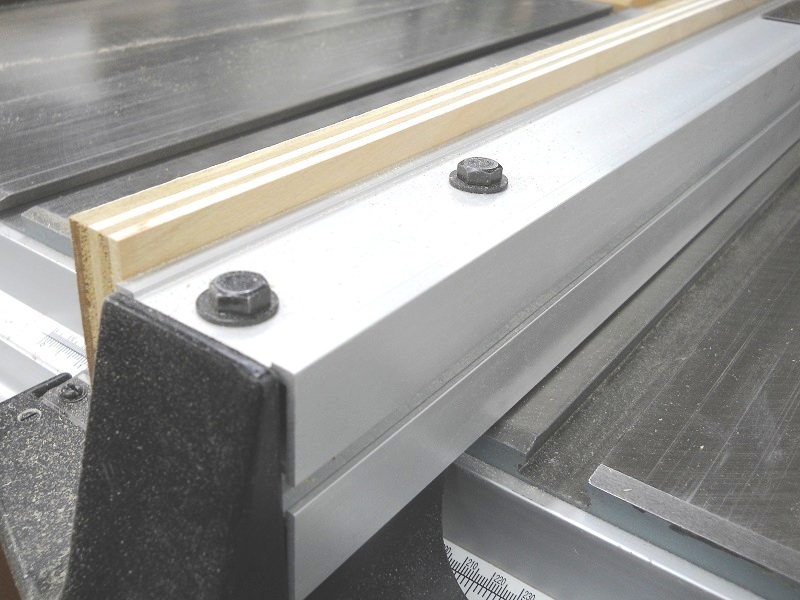 Note that the saw blade can’t cut through the adjustable arm because of its 3″ limit in height, what is the same as the plywood strips height. La différence entre la précision et l’approximation. Enfin ! The different between precision and approximation. Finally ! 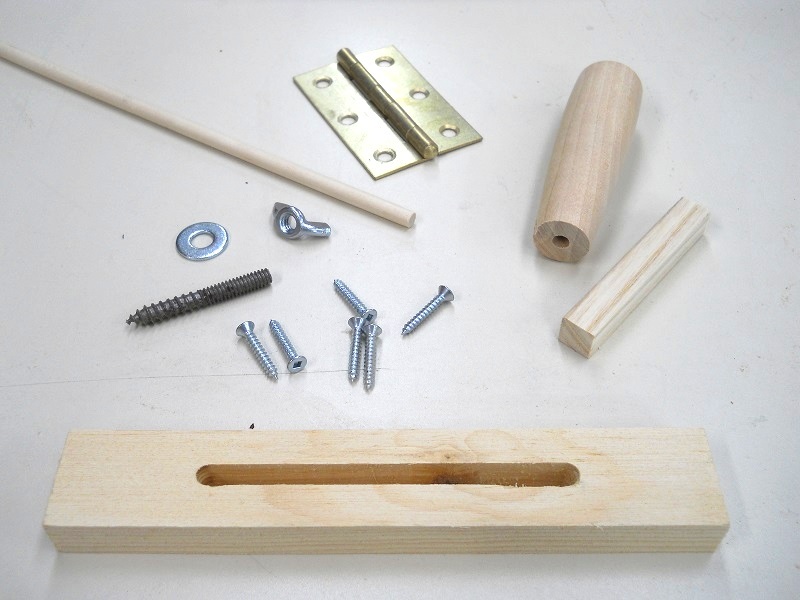 This entry was posted on Saturday, September 13th, 2014 at 04:00 and is filed under Shop Made Jigs / Gabarits maison. You can follow any responses to this entry through the RSS 2.0 feed. Both comments and pings are currently closed. Hi, I love your website and it is the only blog that I read consistently as notifications appear in my email. The information in not so lengthy as to loose my attention and the subjects are always unique and interesting. Please keep up the good work. 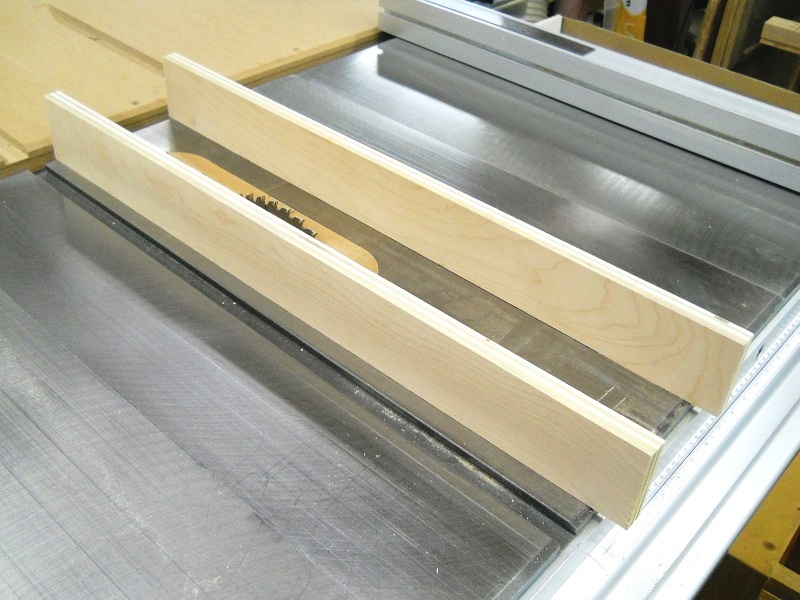 I did have a question on today’s project, the tapering jig for your table saw. 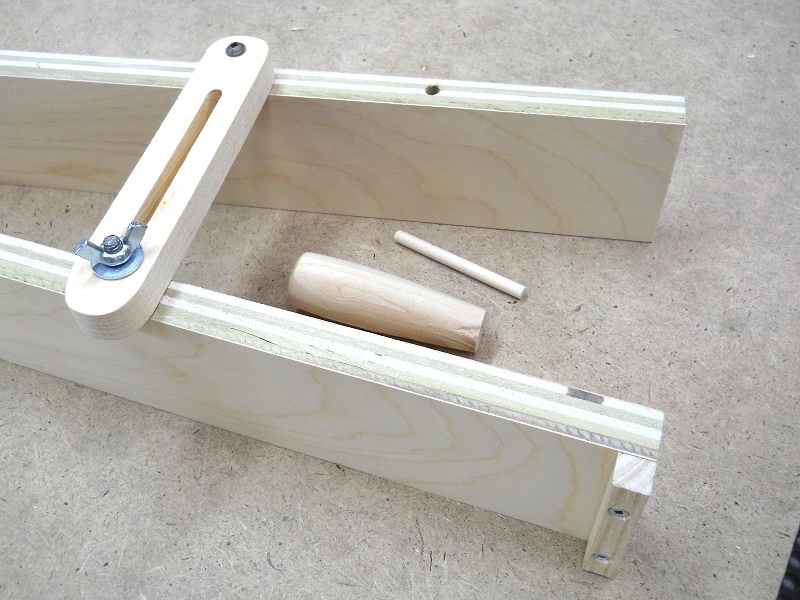 Is there a specific reason that you changed the fixed point of the adjusting mechanism on the new jig? 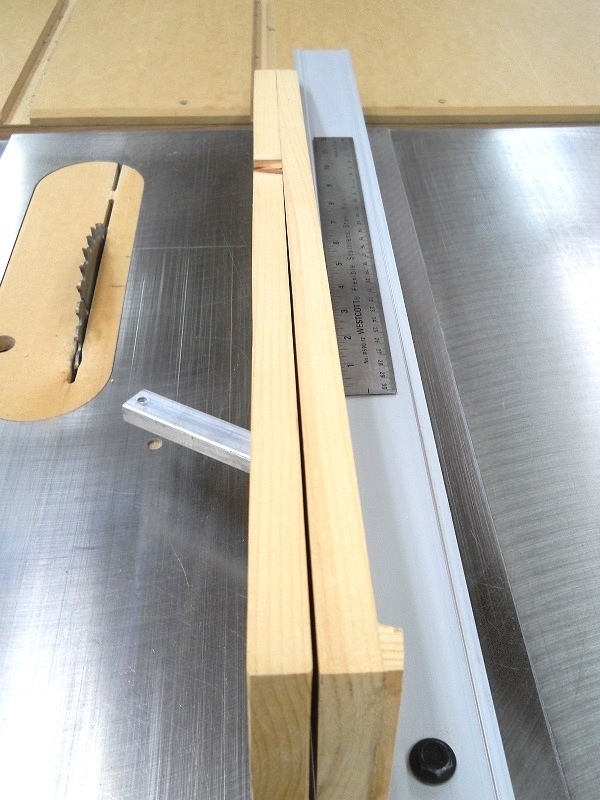 Or does that even matter since the blade of the table saw doesn’t cut more than 3″? With the adjuster fixed on the other side maybe you could taper larger pieces on the table saw, but with the much smaller table and fence it may be too unbalanced. I would love to hear you opinions on this. Thank you. Hi Dan, Thank you so much for your kind words and thank you for following me in my woodworking journey. To answer your question, it’ll be very simple. I installed the adjuster on the left side only because I felt uncomfortable having/seeing it over the rip fence. As mentioned, I only checked it wouldn’t be notched or cut by the saw blade, reason for the 3″ jig height, the same as the protruding saw blade. 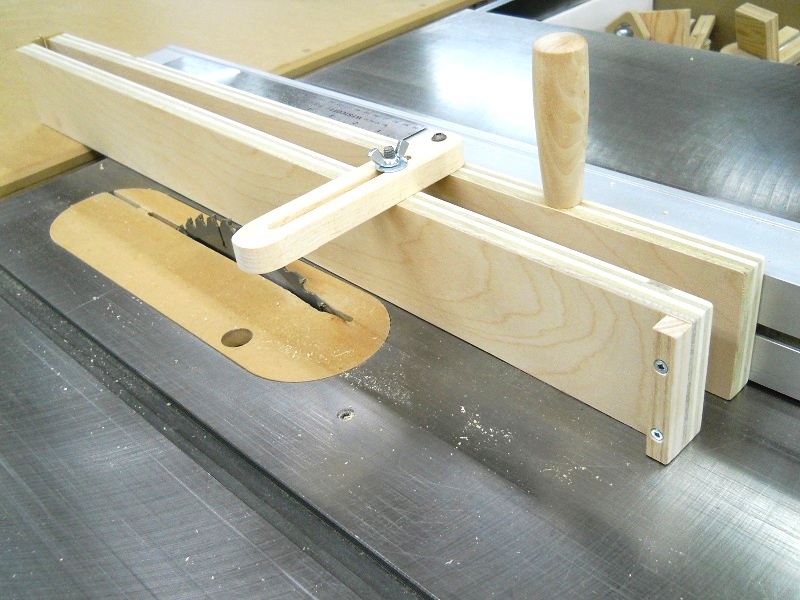 Besides that, if I would have to taper larger pieces, I would use the band saw, or even the jointer, which I never tried but saw and read about the technique. 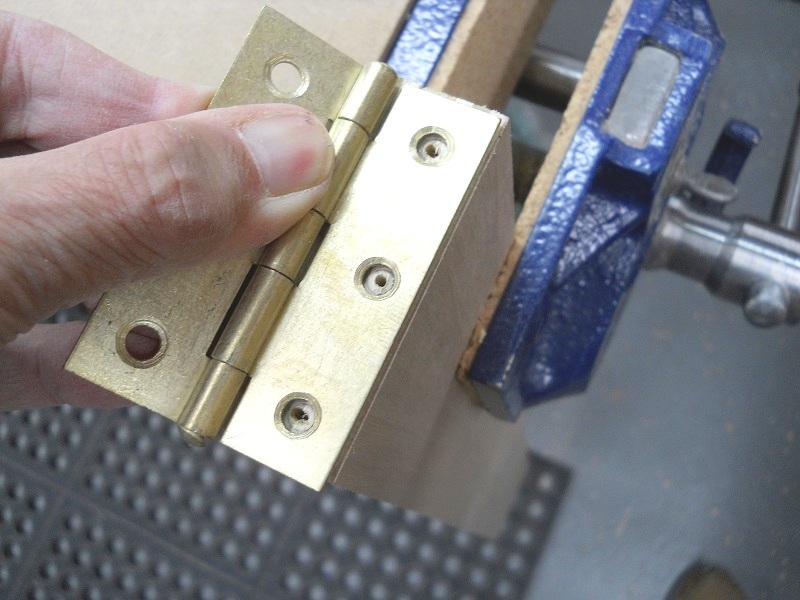 I have used the jointer for tapering, with some stop blocks set up for repeatability. I liked the process. Thanks for sharing your experience with the jointer. 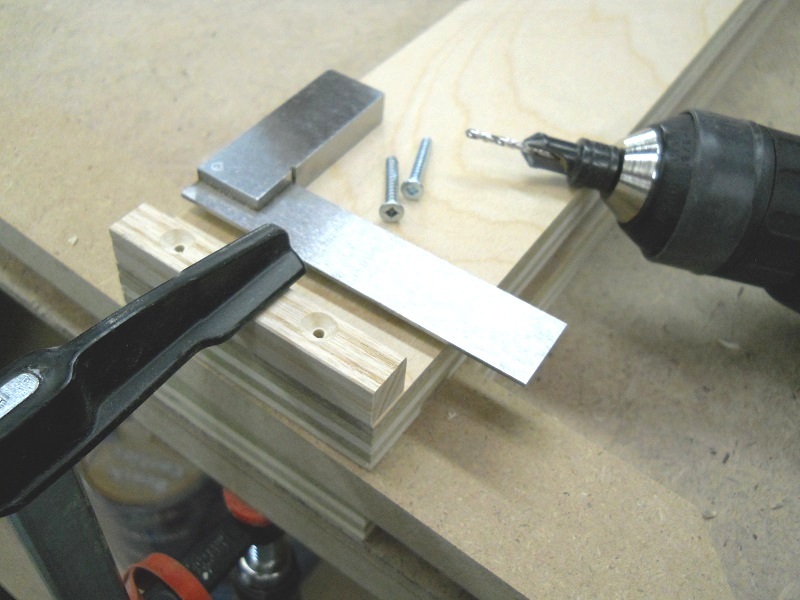 One of the good thing is that you don’t need a huge jointer for this technique. As mentioned, I will try it some day. The post ‘inspired’ me to replace my aging jig. Rather than using plywood, I used Trex. I have used it on several other projects. 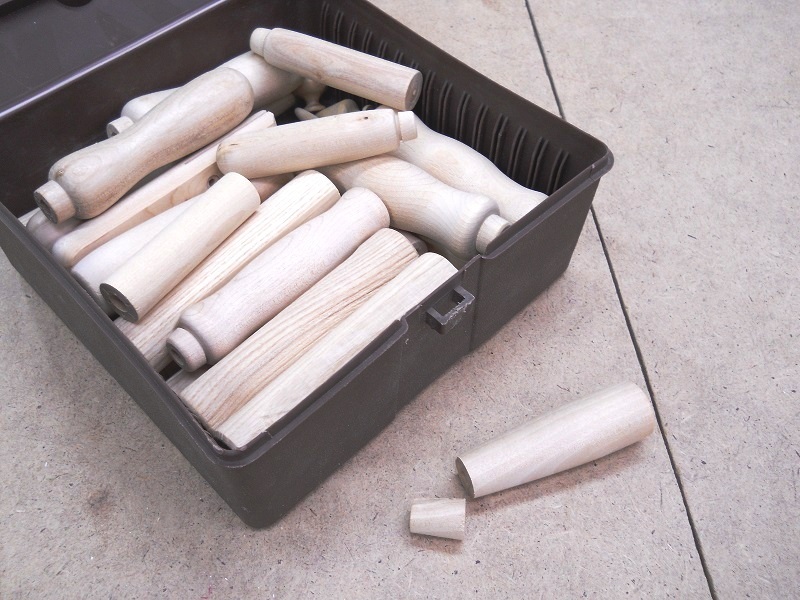 It is much heavier than wood, but is very stable. You can often get a damaged board from places like Home Depot or Loews.. I never heard about Trex. I’ll take a look on that. Thanks.